Shingle Belting's truly endless TrenPull belts are designed with many years of application experience and manufactured on state-of-the art equipment. This equipment was designed to eliminate the construction inconsistencies of belts made on autoclaves by applying consistent heat and pressure throughout the bonding process. Shingle Belting's TrenPull truly endless belts are designed for maximum performance on Linear Capstan and Caterpuller equipment in the Wire & Cable and Plastic extrusion industries. Consisting of the highest quality raw materials, the rubber and thermoplastic cover materials and tensile fabrics have been developed to solve problems for OEMs and end users worldwide. The rubber is available in a variety of colors and durometers and can be provided with grooves in the length and width direction. These grooves are engineered to meet our customers' flexibility and product fit requirements. 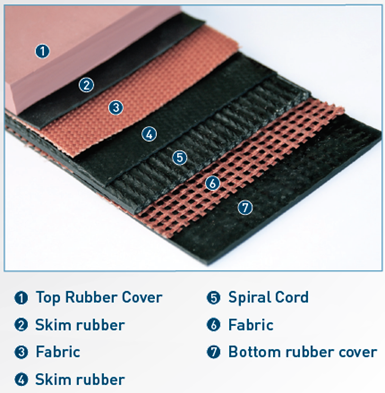 The premium rubber and reinforcement materials result in truly endless belts that offer maximum performance. Specially compounded TrenPull rubber covers are designed for maximum abrasion resistance and uniform pull throughout the belt's life. High tensile fabric for low elongation. Manufactured truly endless, TrenPull belts have no splice that can fail. High coefficient of friction covers are engineered with the proper elasticity to resist compression and can be milled to exacting thicknesses. Available with a wide range of fabrication including longitudinal and lateral grooves. 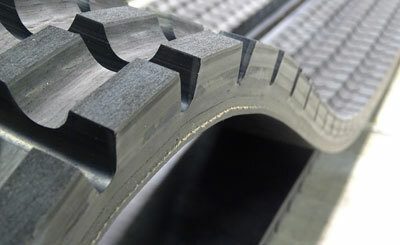 Base belt options include flat, poly-v, timing, and custom belt surfaces. To view these documents, you need Adobe Acrobat Reader. You can download a free copy from the Adobe web site.